Lands' End has established an excellent reputation in its forty years as a mail order company, although it now sells over the internet as well as through outlet stores. Both their UK and US collections have sections for tall men's clothing. 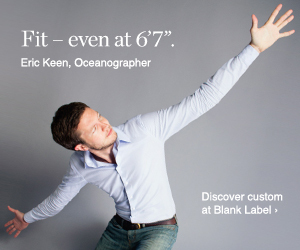 I particularly like the Lands' End UK web site because the men's collection has separate 'Tall' sections highlighting extra long trousers, shirts and jackets so that you don't have to go through the usual process of looking at the details on every item on the website to find the few that offer a tall option. Right now Lands' End have reductions on tall shirts, including a good range of polo shirts in different styles and fabrics with short or long sleeves, including their most handsome polo shirt with "hand picked Peruvian pima cotton". The tall fitting gives an extra 1.5" (3.8cm) of length to suit men up to a height of 6'3" (190cm). They also have reductions on some jackets, including a range of fleeces in different styles and some waterproof and winter jackets. The tall selection of trousers doesn't look big at first sight - the web site has a small selection of chinos and corduroy jeans with waist sizes from 34" (chinos) or 36" (cords) up to 44" and lengths right up to 38" (96.5cm) inside leg and you can get exactly the inside leg length you want to the nearest quarter inch. You can even order unfinished trousers with a 40" inside leg (a generous 101.5cm!). However, you can still find long trousers in their 'normal' section - they have around 12 different styles, most of which go up to a 36" inside leg with waist sizes from 32" up to 44" which is a pretty good range. By taking the unfinished trousers, you can get a 38" inside leg, which can still be hemmed to give around 37-37.5" inside leg. There is free delivery in the UK on orders over £50, and delivery in Europe is reasonable. For the US you will need to go to www.landsend.com but you can also find Lands' End concessions in many branches of Sears.